Jordanian officials announced the release of Abu Muhammad al Maqdisi, a pro-al Qaeda, anti-Islamic State jihadist ideologue earlier today. And the news was quickly celebrated by Maqdisi’s allies on social media. A Twitter feed associated with Abu Qatada, one of Maqdisi’s closest comrades, tweeted the news of the release. One tweet praises Allah and shows a picture of the two longtime jihadist thinkers sitting together. The picture can be seen above, with Maqdisi on the reader’s left and Abu Qatada on the right. The pair has helped lead al Qaeda’s ideological attack against the Islamic State, which claims to rule over large parts of Iraq and Syria as a “caliphate.” Al Qaeda officially disowned Abu Bakr al Baghdadi’s organization in February 2014. The celebratory tweets posted in Abu Qatada’s name were quickly retweeted by other al Qaeda jihadists, including Sami al Uraydi, a Jordanian who serves as the Al Nusrah Front’s chief sharia official. The Al Nusrah Front is al Qaeda’s official branch in Syria. Abu Mariya al Qahtani, another official in Al Nusrah, praised Maqdisi’s release. 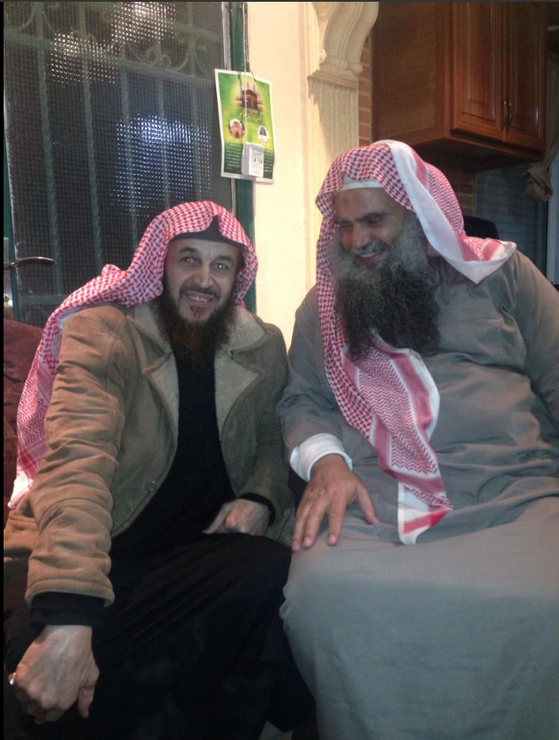 And so did Dr. Abdallah Muhammad al Muhaysini, an al Qaeda-linked cleric who works with Al Nusrah in Syria. Muhaysini tweeted the photo shown above as well. Maqdisi’s release comes just days after the Islamic State posted a grotesque video online showing a Jordanian pilot, Mouath al Kasaesbeh, being burned alive. And a Jordanian television station is already advertising an “exclusive interview” with Maqdisi, who criticizes the Islamic State once again. He reportedly will say that he tried to negotiate the pilot’s freedom in exchange for the release of Sajida al Rishawi, a failed al Qaeda in Iraq suicide bomber. Rishawi was executed by the Jordanian government after Kasaesbeh’s death was publicly confirmed. It has long been assumed that Jordanian authorities are willing to tolerate some of Maqdisi’s activities, as he is one of the Islamic State’s most authoritative critics within the jihadist community. But such an arrangement puts the Jordanians in the awkward position of being tacitly allied, even if only on occasion, with a thinker who strongly backs al Qaeda and its leader, Ayman al Zawahiri. While still imprisoned in May 2014, Maqdisi released a statement blasting the Islamic State as a “deviant organization.” The message was promoted online by the Al Nusrah Front. In the jailhouse letter, Maqdisi revealed that he had attempted to broker an end to the dispute between the Islamic State and al Qaeda, as the two jihadist organizations had been openly at odds since April 2013. He claimed to have advised Abu Bakr al Baghdadi and Zawahiri. Maqdisi even said that he had been in direct contact with Zawahiri, whom he referred to as “our beloved brother, the Sheikh, the Commander.” He blamed the failure of his mediation efforts solely on Baghdadi. Maqdisi has been periodically released from prison, only to find himself behind bars once again. He was released for a time in mid-June of 2014 and, in short order, issued another statement concerning the Islamic State. He refused to disavow his rebuke of the group from the month before, saying the speculation that Jordanian authorities put him up to it was false. Officials in the Al Nusrah Front praised Maqdisi’s short-lived freedom at the time. Jihadists from around the world have attempted to impeach the Islamic State’s credentials by relying on Maqdisi’s teachings. For instance, Ali Abu Muhammad al Dagestani, the head of the Islamic Caucasus Emirate (ICE), has spoken of Maqdisi, along with Zawahiri and other al Qaeda ideologues, in glowing terms. Some ICE jihadists have defected to the Islamic State, but web sites affiliated with the organization continue to advertise Maqdisi’s anti-Islamic State writings. Maqdisi’s animosity for the West and the US is clear. On Sept. 30, 2014, he and other jihadist thinkers released a proposal calling for a ceasefire between the warring factions in Syria. Their main argument was that the Islamic State, Al Nusrah and other groups had a common enemy in the “Crusaders.” The US-led coalition began bombing Syria one week earlier. The proposed ceasefire appears to have been rejected by the Islamic State. Last December, the Guardian (UK) reported that Abu Qatada and Maqdisi had attempted to negotiate with the Islamic State on behalf of Peter Kassig, an American aid worker who was held captive by the group. Their effort failed as Kassig was ultimately beheaded. Some al Qaeda officials objected to Kassig’s murder on the grounds that he was assisting Muslims in Syria and had been welcomed by their co-religionists. In their view, therefore, it was illegal under sharia law to kill him. The Islamic State, however, consistently disregards the sharia arguments made by al Qaeda officials, Maqdisi, and others.